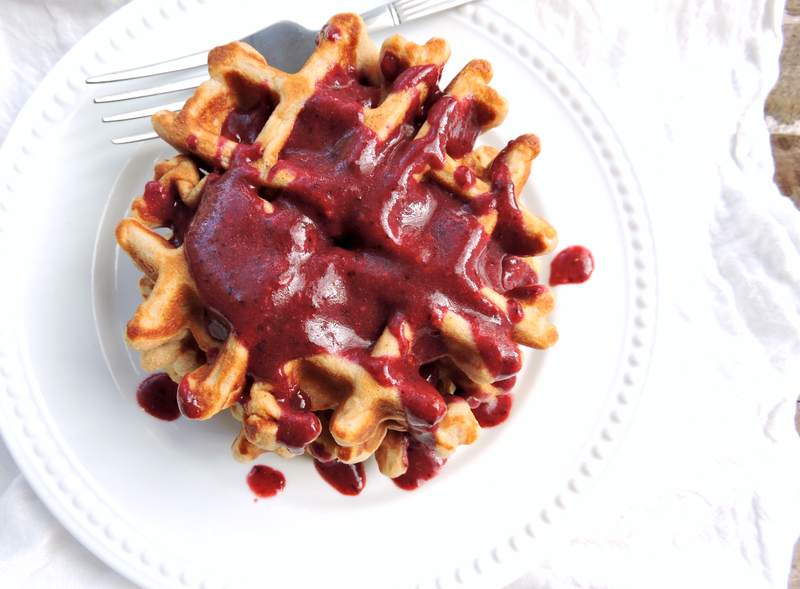 Just Jessie B: Cashew Waffles with Berry "Syrup"
Cashew Waffles with Berry "Syrup"
When Whole30 ends on a Saturday, you go big for Sunday brunch. & Since eggs and sausage are the usuals on the breakfast menu around here... big = WAFFLES. My goal for these was to create that delicious "waffle" flavor & texture I had been missing: perfectly soft, thick, & fluffy; but, I wanted it to be done with technically Whole30 compliant ingredients. I figured this would be the best way to get that "SWYPO"/junk food fix while sticking to the ingredients that my body would appreciate. Because while sweetening these with honey then drowning them in pure maple syrup sounded wonderful, I wasn't so sure that my body would think so. Especially after all that time detoxing from sweets. So I stuck to dates for my sweetener, and topped my waffle stack with a "fruit syrup"-- just berries & coconut oil. It gave the perfectly sweet/tart, fresh balance to the light, cakey waffles~ and it was super duper easy to do. I hope you LOVE these waffles like we did. Try them during your "reintroduction" phase after a Whole30, or any ol' time you're in the mood for some Paleo-friendly waffle action. Heat a waffle maker to "medium", or just set the power to "on" if yours doesn't have heat settings. Place all of the waffle ingredients in a blender or food processor, and blend until super smooth. Grease the waffle maker with butter or ghee. Pour 1/4 cup of the batter at a time into the center of the waffle maker. Press down & cook for about 2 minutes, or until the waffles are light golden brown. Continue this process until the batter is gone. Rinse out the blender, and add the berries and coconut oil. Pulse until smooth. This is your "berry syrup". I heated mine up a bit before pouring it over the waffles. 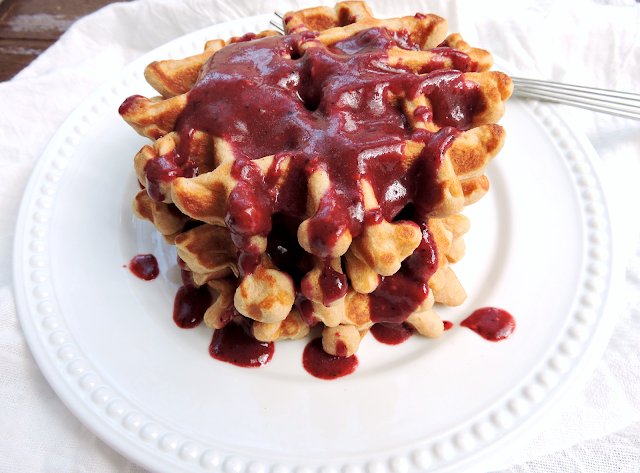 Serve the waffles hot topped with extra grass-fed butter or ghee, and plenty of berry syrup. Enjoy! Feel free to add some maple syrup or honey to the "berry syrup" if you want it more sweet than tart! As soon as I saw this post I knew I would have to try it my first morning after Whole 30 was over. That was this morning, and they were awesome! I do not have a waffle maker so I made them into pancakes with my griddle, and they turned out great. 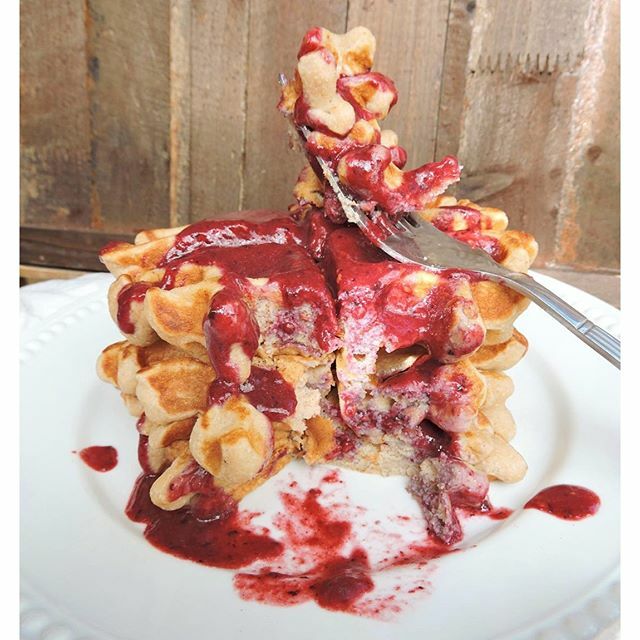 Thanks for this recipe it is the best paleo pancake/waffle mix I have tried! Great to know that they work well as pancakes!! Thanks so much for the great feedback, Bess!